In this 10 unit course, Mr. Taulbert discusses the urgent need for character education in our schools. He is joined by various guest speakers. Teachers, coaches, and corporate leaders discuss techniques to engage parents and community members in promoting ethical behavior by their children and in creating “community” to support moral and character development in schools. Taulbert uses case studies that demonstrate successful character education programs as well as testimonials from guests of their successes in implementing strategies in their own teaching practices. Participants learn to identify character issues in their classrooms and mobilize resources from parents and community members to implement a plan that integrates character education into their core curriculum. Clifton Taulbert, International Lecturer, Pulitzer Nominee (The Last Train North) and a Time Magazine recognized emerging entrepreneur credits the “Community” that surrounded him while growing up on the Mississippi Delta for his personal, academic and professional success. 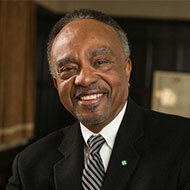 Taulbert was chosen by CNN at the turn of the millennium as a “Voice of Community” captured in his award-winning book, Eight Habits of the Heart. It also garnered him an invitation to address members of the U. S. Supreme Court as a guest of Justice Sandra Day O’Connor. His subsequent follow-up for k-12 educators-Eight Habits of the Heart for Educators made its debut at Harvard University Principals center where Taulbert lectured for several years. Taulbert has authored fourteen books and when not lecturing globally, Taulbert is involved in the life of Tulsa where he serves on numerous boards including the University of Tulsa and the Oklahoma Foundation for Academic Excellence.